When I was a kid in North Carolina, I would always beg my mother to take the scenic route any time we would head to the neighboring city that had a mall, restaurants, etc. Instead of taking the highway, I always wanted to go "under the trees" which was basically a long stretch of road with huge oak trees that made an arch over top the road. I was kind of like a tunnel and I would roll the window down and enjoy the feeling. I had forgotten about it until I saw these pics and I wonder what it looks like now. Maybe I will take the scenic route next time I'm home. It never hurts to slow down a bit. Love everything about this. Love those pants and sweater! Beautiful! Fifteen bones girl! Getcha some! 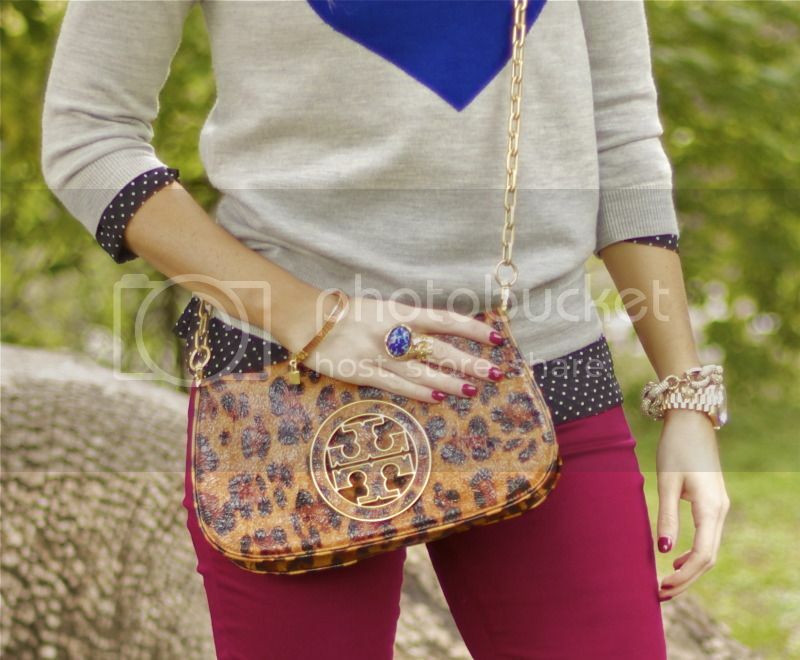 I have same sweater and again like this combo as I have been searching for burgundy skinny jeans!! This may be a great choice. It pairs nicely with Heart Me sweater:) you look great! That's funny you should mention a plaid shirt under sweater...I wore the sweater with an older J Crew Plaid button down a couple weeks ago. There is actually a pic of me wearing said combination on my instagram. Looks cute with the plaid! Are you on instagram? Argh! I need to be! You are the 10,000th person to ask me if I am. I guess I better get in with the cool kids and start one. I love this sweater with a plaid shirt. It's one of my favorite looks! OMG I wore my heart sweater on the blog yesterday! Mine's pink!! I love the way you paired the blue with those gorgeous jeans! I also love the layered necklaces over the sweater! Thanks Meredith! I can't get enough of this sweater. I haven't quite jumped onto the cat sweater trend that seems to be lurking, not really my thing, but I love this little thing!